November 26, 2012 | David S. Maldow, Esq. 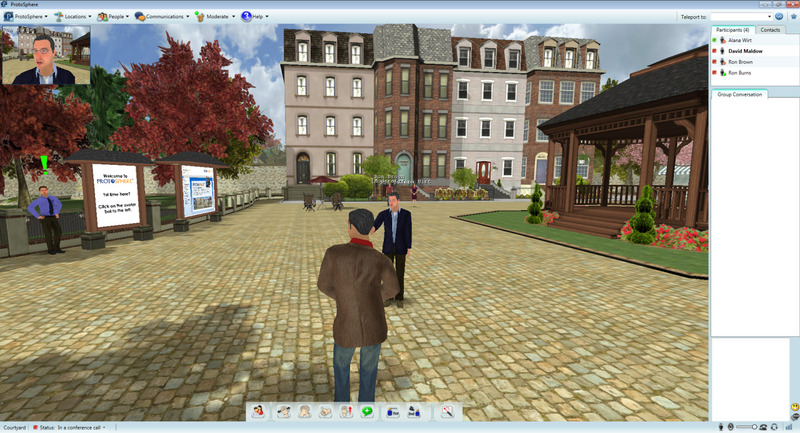 virtual environments and answered my questions about how it all works. For a quick overview, check out this video walkthrough. ProtoSphere environments are visual representations of actual Lync conference rooms. The VoIP, presence, and instant messaging are all powered by Lync running in the background. In other words, integration with Lync (and the rest of the MS UCC Product Stack) isn't an issue as the solution is natively powered by Lync. After spending some time walking through the environments and trying out the tools, I was pretty impressed. Keep reading to find out what I learned. Upon logging in, I was guided through the process of creating my custom avatar, and while he may not be a perfect doppleganger, it is close enough for comfort. I then found myself in a courtyard, where a few other users were roaming around. The controls are extremely easy to learn, basically the WASD keys move you forward, backwards, left and right, and there are a few context sensitive buttons at the bottom of the screen. Audio, IM, and presence all worked fine, as expected. When Ron spoke, I saw his avatar in a small PIP in the upper left hand corner of the screen. In larger groups this feature could be very helpful, to let everyone know exactly who is speaking at all times. Ultimately, I would like to see this PIP be a live video, from my webcam (which Ron has said is on their near-term roadmap based on the integration with Polycom). A small dropdown menu at the top right of the screen shows a list of available rooms. When you click on a room, you immediately teleport to that location. Ron and I went to a large meeting room (shown above) to check out some basic collaborative features. There wasn't much for me to learn as you can simply add content to any of the "displays" by dragging items (PowerPoint, etc.) from your desktop. Ron was also able to share his video (see below) via the Polycom integration. I think this particular functionality is really essential to this kind of a solution. While the avatars give a sense of presence, nothing matches the delivery of a presentation by a human face for full impact. 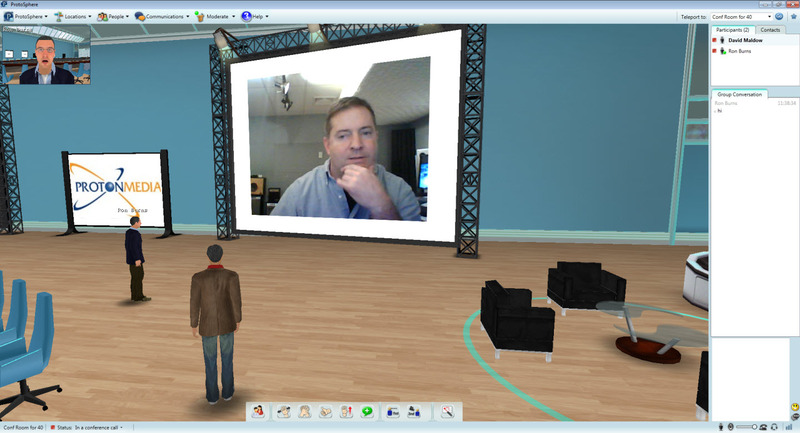 Ron sees ProtoSphere at the top of the Lync UC world in terms of immersion and connectedness for large groups. Obviously, the highest form of natural connectedness is an actual face to face meeting. 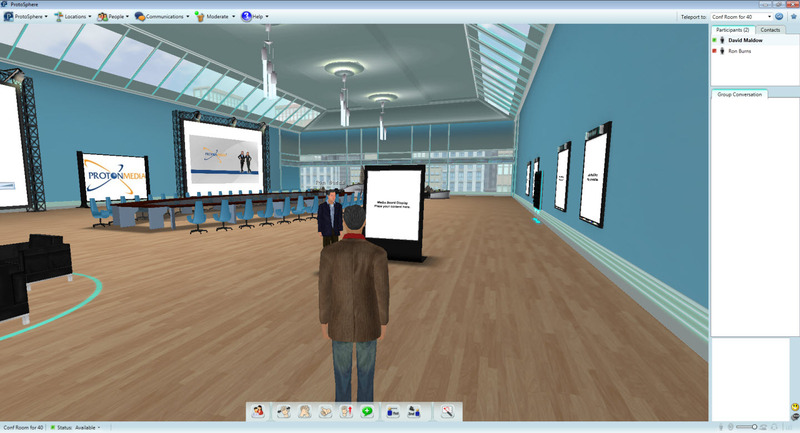 In my opinion, the highest form of remote connectiveness is a proper telepresence solution, as it presents the illusion of an actual face to face meeting. However, telepresence doesn't always work for large groups as only a few people can be on screen. For a 50 person meeting, a virtual trade show, or even a�large webcast, it is hard to get a sense of who is actually attending at any given time, when only a few people are visible via video. 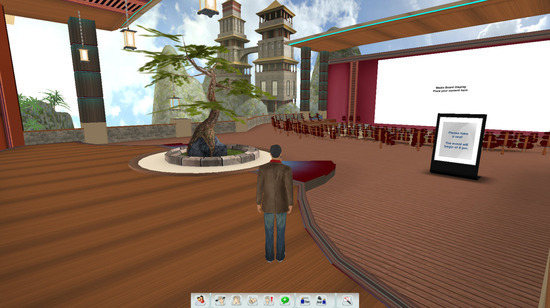 Whereas with ProtoSphere, dozens of people can walk around, interact, and attend an event in a large virtual space. ProtoSphere allows users to easily create custom meeting spaces. I like the idea of having spaces associated with specific projects. I believe the common visual indicators (everything from the color of the room, to its decorations) will work to bring the attendees' mindsets back to where the last meeting left off. While I was impressed by all of the various architecture options and room decorations, I really loved the 3D content and visualization tools. In the image below, Ron showed me what appeared to be a 3D hologram of a partly visible human torso in a ProtoSphere meeting room. While it is hard to appreciate from the 2D screenshot above, the images were not flat. They were rotating and I was able to walk around them. I could see they had depth. 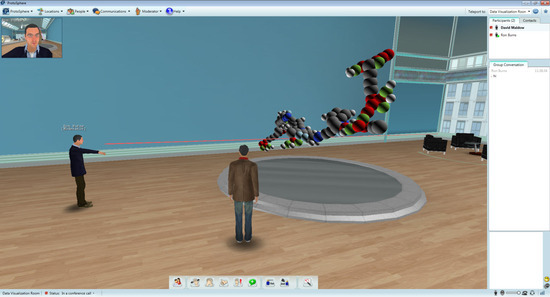 In the graphic below, Ron's avatar was using a laser pointer to highlight an area on a rotating 3D model. If a picture is worth a thousand words, a 3D graphic model may be worth a million. It doesn't take much imagination to see how this type of tool could be useful in education, product development, medical science, etc. etc. etc. This is one of those technologies where you really have to see it in action to "get it." The company is offering trial downloads, so perhaps you can jump in and see how it feels for yourself. Until then, here are a few shots I took while touring some of the cooler looking environments. While some of it may be excessive for your tastes, I think it serves a purpose beyond the cool factor. Meetings that occur in memorable locations, may be more memorable as a result. The ProtoSphere solution, with its deep Microsoft integration, is ready for broad scale enterprise deployment. The question is whether enterprise is ready for ProtoSphere. I definitely see significant value over an audio only meeting, or even a webcast; and with younger knowledge workers emerging, enterprises need to begin to embrace this kind of technology that the kids have been leveraging for years. 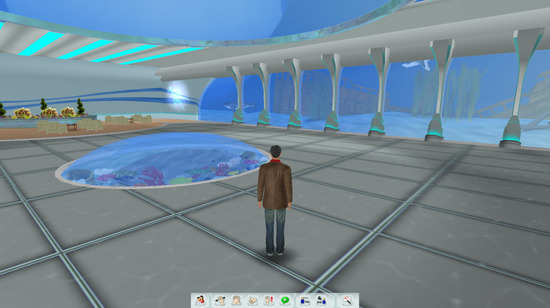 \n\nProtoSphere environments are visual representations of actual Lync conference rooms. The VoIP, presence, and instant messaging are all powered by Lync running in the background. In other words, integration with Lync (and the rest of the MS UCC Product Stack) isn't an issue as the solution is natively powered by Lync. After spending some time walking through the environments and trying out the tools, I was pretty impressed. Keep reading to find out what I learned. \n\n \n\nUpon logging in, I was guided through the process of creating my custom avatar, and while he may not be a perfect doppleganger, it is close enough for comfort. I then found myself in a courtyard, where a few other users were roaming around. The controls are extremely easy to learn, basically the WASD keys move you forward, backwards, left and right, and there are a few context sensitive buttons at the bottom of the screen. Audio, IM, and presence all worked fine, as expected. When Ron spoke, I saw his avatar in a small PIP in the upper left hand corner of the screen. In larger groups this feature could be very helpful, to let everyone know exactly who is speaking at all times. Ultimately, I would like to see this PIP be a live video, from my webcam (which Ron has said is on their near-term roadmap based on the integration with Polycom). \n\n\n \n\nA small dropdown menu at the top right of the screen shows a list of available rooms. When you click on a room, you immediately teleport to that location. 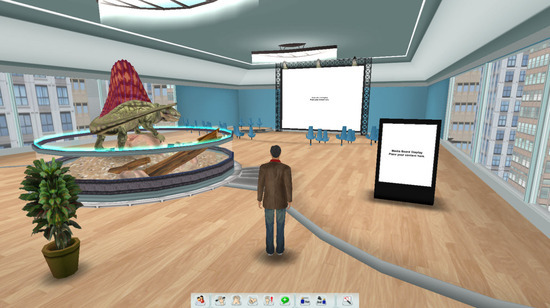 Ron and I went to a large meeting room (shown above) to check out some basic collaborative features. There wasn't much for me to learn as you can simply add content to any of the \"displays\" by dragging items (PowerPoint, etc.) from your desktop. Ron was also able to share his video (see below) via the Polycom integration. I think this particular functionality is really essential to this kind of a solution. While the avatars give a sense of presence, nothing matches the delivery of a presentation by a human face for full impact. \n\n\n \n\nRon sees ProtoSphere at the top of the Lync UC world in terms of immersion and connectedness for large groups. Obviously, the highest form of natural connectedness is an actual face to face meeting. 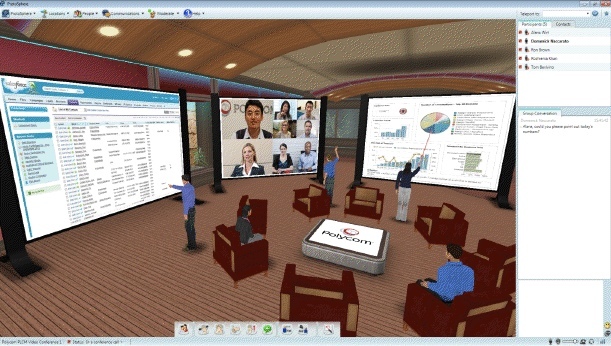 In my opinion, the highest form of remote connectiveness is a proper telepresence solution, as it presents the illusion of an actual face to face meeting. However, telepresence doesn't always work for large groups as only a few people can be on screen. For a 50 person meeting, a virtual trade show, or even a�large webcast, it is hard to get a sense of who is actually attending at any given time, when only a few people are visible via video. 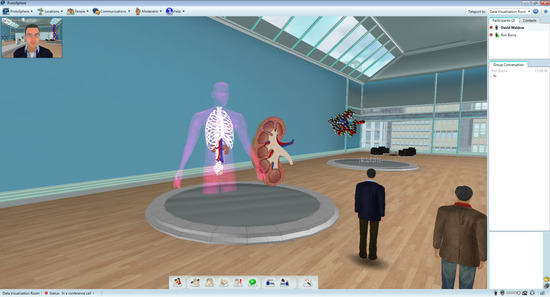 Whereas with ProtoSphere, dozens of people can walk around, interact, and attend an event in a large virtual space. \n\n \n\nProtoSphere allows users to easily create custom meeting spaces. I like the idea of having spaces associated with specific projects. I believe the common visual indicators (everything from the color of the room, to its decorations) will work to bring the attendees' mindsets back to where the last meeting left off. While I was impressed by all of the various architecture options and room decorations, I really loved the 3D content and visualization tools. In the image below, Ron showed me what appeared to be a 3D hologram of a partly visible human torso in a ProtoSphere meeting room. \n\n \n\n\nThis is one of those technologies where you really have to see it in action to \"get it.\" The company is offering trial downloads, so perhaps you can jump in and see how it feels for yourself. Until then, here are a few shots I took while touring some of the cooler looking environments. While some of it may be excessive for your tastes, I think it serves a purpose beyond the cool factor. Meetings that occur in memorable locations, may be more memorable as a result. \n\n \n \n\nThe ProtoSphere solution, with its deep Microsoft integration, is ready for broad scale enterprise deployment. The question is whether enterprise is ready for ProtoSphere. I definitely see significant value over an audio only meeting, or even a webcast; and with younger knowledge workers emerging, enterprises need to begin to embrace this kind of technology that the kids have been leveraging for years.